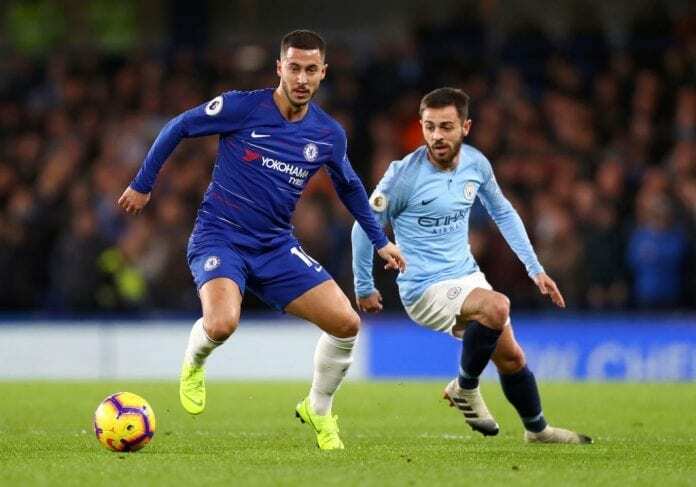 Chelsea winger Eden Hazard, spoke in detail about his new position inside the pitch during last Saturday’s victory against Manchester City. The win that Chelsea got against Manchester City last Saturday may not mean that the Blues will get to compete for the Premier League, but it was very important for Eden Hazard after tasting a brand new position on the pitch. The Belgian winger was widely recognized as the best player in the match, he was the main offensive football producer throughout the game and led his squad to victory despite not being able to score a goal. This level of performance has an explanation that manager Maurizio Sarri revealed after the match, the plan was to use Hazard as a false ‘9’ and the wager paid off big time. This decision came thanks to the Italian manager’s initiative to try and get the very best out of Hazard’s skills, a player who can perform at the same level in any place of the pitch and even improve when you place him up front. The comparisons with what Pep Guardiola did with Messi back in the day are inevitable, the false ‘9’ term was first utilized during that era when the Catalan manager decided to exploit his best player’s finishing skills. Given that Eden Hazard might currently be at the top of his game, it would be stupid to not even attempt some experimentation with his position. The decision to use him there has the potential to become a game changer for the rest of the season, mostly because this is the first time that the player plays this specific role under Maurizio Sarri. Last season under Conte, Hazard did play as a centre-forward but Antonio’s system was way more defensive than the already familiar Sarri-ball that people have fallen in love with this season. The results of using Eden as a striker are very different under each manager, mostly due to their vastly different football philosophies. “I like it, because I played it last year also, so I know what to do, but the feeling is a bit strange because you don’t touch the ball a lot,” said Hazard on Chelsea FC’s official website. “We just want to win games and now this one has finished, we can enjoy the win, but we need to be focused for the game on Thursday [against Vidi in the Europa League] and next week at Brighton,” he added. In this video, we explore the role of the 'False 9', its history, application, and modern value. The only documented result of this position is with Leo Messi and Pep Guardiola, Hazard would be the second one but we are in no way trying to compare one player with the other one. Lionel Messi is very different than the Belgian winger, but both players are equally important to their clubs and Hazard does have a good chance to net many goals for Chelsea this season if he remains on that position. The only problem he may have is the discomfort of other strikers who will inevitably get relegated to the bench, people like Olivier Giroud or Alvaro Morata will play much less with this new system. Despite beating Manchester City last Saturday, Chelsea’s top target is the UEFA Europa League this season as they are still seven points behind the Citizens and reaching them could prove impossible this season. Maurizio Sarri knew what he was getting himself into when he agreed on a new contract with the Blues, but he accepted because he has a player like Eden Hazard to build a competitive squad that can help them win bigger trophies in the future. What do you think about Eden Hazard’s new role at Chelsea FC? Please share your opinion in the comment section down below.